In this article, we cover the Petit Lenormand House system, which is a technique actually documented back in a French book on Cartomancy, published in 1875 (I’ll keep looking for more references). 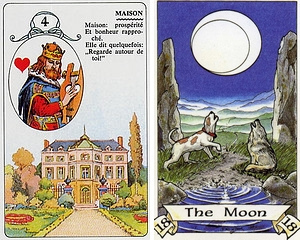 The book claims that it reveals techniques used by both Etteilla and Ms. Lenormand, but the book is authorless and while it accurately describes a 9X4 Grand Tableau, the Lenormand House technique described in it wasn’t actually developed with the Petit Lenormand Oracle in mind. Rather, it was developed for ordinary playing cards. However, while the method described isn’t for the Petit Lenormand Oracle, it has been adapted for it. In its first chapter “L’oracle parfait, ou Le passe temps des dames : art de tirer les cartes avec explication…” (Tous les Libraires, Paris, 1875), claims to describe the “Art of Reading Cards according to Ms. Lenormand’s own Method,” but for reading every day playing cards. The description the author gives is rather close to what we might consider a Petit Jeu Lenormand today: “You take a deck composed of 36 cards, of which: the ace, the king, the queen, the jack, the ten, the nine, the eight, the seven and the two of hearts, diamonds, spades and clubs.” The book then goes on to describe how the cards ought to be laid out in 9X4 fashion. Was this truly how Ms. Lenormand read her cards? We can’t say for certain, and some might pour over the card definitions contained in the book and cross-reference them to meanings that Ms. Lenormand herself alluded to in her own writings to find out if they might actually match, but they do not correspond to the symbols that we know today (the Rider, the Clover, the Ship, etc). Did you notice the numbers from 1 to 36 on your Petit Lenormand Oracle? If your deck doesn’t have these numbers, you could always inscribe them on your deck for easy reference, but those numbers are your biggest clue on how the House System works! Ever try to place them in sequential order from 1 to 36? If you did, then you’ve seen where the Lenormand Houses are located! The onus of this technique is identifying where the houses are in the first place, and then seeing what cards fall where. For example, a card that falls in position 3, it is said to be in the House of the Ship; a card that falls in position 36 is in the House of the Cross, etc, etc. Not sure what I’m talking about? That’s ok! It’ll get clearer in a moment (I promise! ), and if you want to use the 8X4+4 instead? That’s ok too! That’s great, LE, but how do I use this, exactly? Well… now that you know that the very first house is the House of the Rider, then any card that falls there gives you an idea of what the cards are going to “discuss” given that the rider brings messages and news. Scythe in the House of the Rider: News about a seperation. Lily in the House of the Rider: News about an older man. Mice in the House of the Rider: News about some worries, etc, etc. And if a card falls into its own house? Then mountains are bigger, the paths are many, the honour and recognition might be twice more than expected… in any event, I highly encourage you to use the House System in conjunction with other techniques, if only to get better details for the story they’re trying to tell you. In our next article on Advanced Techniques, we’ll show you how to tie all these techniques together – Stay tuned for Part 5! and the cross falls in the woman’s house? and the anchor falls in the tower house. in the last two houses. When the querent falls in the last house, it normally means she’s about to undergo some big changes in her life. Her future is unknown, so we don’t know what those changes are. All we know is what led to the changes. With the Woman in the house of the Cross and the Cross in the house of the Woman, these changes could be a burden for her and feel like they’re fated. Hello! Lady in the Cross means someone who had undergone some trip or is returned from a diligence(if work involved). Also Cross in the Lady’s house would mean you are a self- centered person, you give great importance to yourself, your life and happiness, it has a holistic impact in your inner world. Cross intensifies every house and card it meets. Also Cross refers to timeless distances and spaces so it would be good to interpret it as a long- term evolution of things, here Stars have also a quite similar efect, but only excluding the practical nature of the Cross, Star is good for love themes, it signifies the long term relationship, as it is standing in the natural order of the cards before the ring and combining it in the diagonals. When combining the card and house is the House card A and dealt card B.? So A ( noun) and B ( qualifies). Example- Mice in House of Whip = arguments that lead. To worries. Or is it reversed, worries that lead to arguments? Hi Anne, I read houses as House Card + Dealt Card. In your example, it would be Whip + Mice: arguments that lead to worries. would you use this technique to do the complete grand tableau, or just to get more information on specific cards? i read the suggestion to only use two or three of these special techniques per reading. if you use more do you find they begin to contradict each other? do you use the noun-adjective technique in conjunction with the house system? the lady and gentleman are in a way mirrored in yopur sample grand tableau, is there significance in that? You can use it on the entire GT, but I usually use it just on specific cards to gain more information because it can be time consuming. You can use every technique. They don’t contradict each other, but they will become repetitive. In that respect, you can use all the techniques to confirm your reading, but it can take you 8+ hours to analyze a GT if you use every technique. I do use the noun-adjective technique with houses. Knighting the Lady and Man will give you more information on the individuals. The Ring will give you more information on the querent’s relationship. Advanced Techniques for Reading the Petit Lenormand Grand Tableau – Part 3. Really liked what you had to say in your post, Reading Lenormand Grand Tableau: Advanced Techniques | Learn Lenormand, thanks for the good read! Thank you for the kind words, Linda. I plan to add more soon! Hi, First of all I’d like to thank you for the very informative and lucidly written pieces. 1) It seems to me that the House system is an alternative approach to the string system of reading. So when is this recommended over the string system and how is it differentiated in reading? One application I can see is it tells about what is happening in the various aspects of a querrent’s life. For example a ring falling in the house of the bouquet could mean legal/contractual relationships are doing well. And the mirroring technique could be used to glean more about whether it is a ealtionship/contract; while knighting could be used to infer what’s going on at a deeper level on that account. 2) Where would I be able to find a more detailed write up on the 8×4 + 4 Grand Tableaux method please? I would like to learn about using the fate cards. I am also anxiously awaiting your write up on consolidating the advanced reading techniques. Houses, knighting and mirroring are used in a GT exactly as you described. Mirroring can also be used in a string reading, giving additional card combinations and information to answer the question posted in a string reading. 2. There isn’t too much more information to add about the fate cards. They’re simply cards read as a string to indicate what’s to come. The center column of a 9×4 can be read as the fate cards, essentially highlighting important information to know. Hi, today is my birthday and I decided to a general GT for the upcoming 12 months. You said that you see the center column as the fate column, & my card (the Lady) fell in the center column at the bottom in house 32. if i’m in the fate column, what does that mean exactly? Thank you! Happy Birthday Kat!! Lady in the house of the moon! Looks like the spot light will be on you today! Stephen, this is a wonderful series that you’ve created and I’ve learned a lot. It appears that this last post was done sometime mid-November, 2012. What happened to part 5: Putting it all together? LOL ! — Hi Jay, and thanks for pointing that out..! To be honest, life happened, but I do need to start tackling that one don’t I? I’m glad the rest of the series was helpful, and I should be pouring my efforts into getting back into the Lenormand saddle really soon. Stay Tuned..! Hi Celia! I’m sorry to say you’re not the first person to ask! Life got the best of me and I’ve been rather busy. I’ll see if I can get that out to everyone this summer.